Four young warriors from the Minneapolis area have forged an aural battleaxe of heavy metal mysticism and named it Wicked Inquisition. Their self-titled debut long-play CD provides a reminder that rock music fares well on the edge of the precipice, steeped in danger and prophetic intrigue. Illustrating that metal does not necessarily benefit from thrasher speed and/or Malmsteen-style technique. 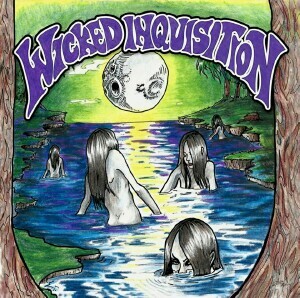 The Wicked Inquisition sonic perspective updates the ominous classic Birmingham [England] metal sound with melody and memorable refrains, perhaps in the style of Masters Of Reality, or Clutch. Comparisons ultimately fail though, since the overall listening experience here is unique, as bulldozer ramrod rhythms collide with meaty blood drenched riffage in a majestic celebration of heavy rock bravado. That said, obviously, this music will strike a [power] chord with fans of early Trouble, The Obsessed, ‘Paranoid’ era Sabbath, and ‘Sad Wings’ era Judas Priest. The most amazing aspect of this group is how they’re achieved such a mature and worldly attitude in their songs and stage show, which on first blush seems to contradict their youthful ages. Considering their level of musicianship and sophisticated compositional skills, my greatest and most sincere wish is that they are in this for the long haul, because this is truly a band that shows immense promise.